What do the creatures of the night choose for a beverage when they need a change from drinking blood? Why Corpse Cola and Ghoul Aid, of course! 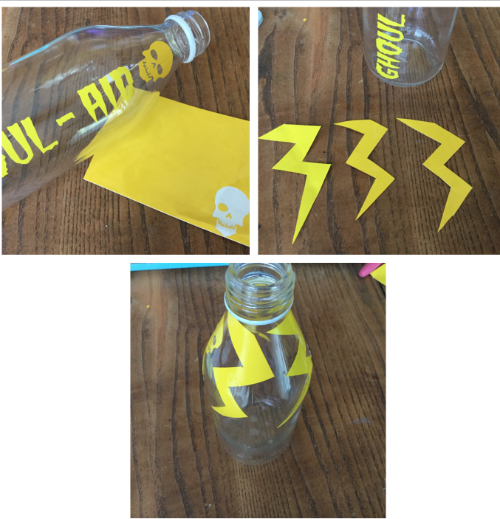 Use transfer paper to transfer lettering to bottles. Use Spellbinders Artisan X-Plorer to cut graveyard from etchmask. Apply graveyard to bottom of Corpse Cola bottle. 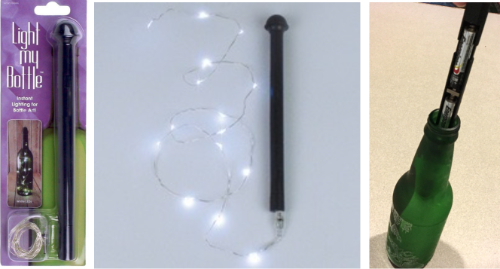 Cut ligthening bolts from etchmask. Mount skull and lightening bolts to top of Ghoul Aid bottle. We are etching the entire bottle, so it is not necessary to use water to pre-determine how much dip n’ etch to pour into the container. Place first bottle into container. Carefully pour etchall dip n’ etch to fill container. 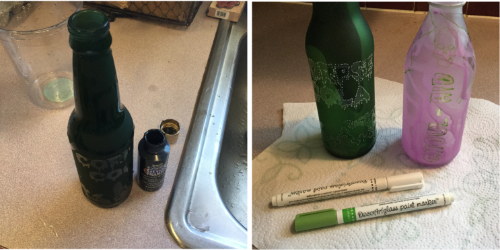 Let set 15 minutes, remove bottle, turn over, and insert top portion to etch. Let set 15 minutes then remove. Repeat with second bottle. Pour dip n’ etch back into bottle – it is reusable! Wash bottles and remove etchmask. Pour a small amount of black DecoArt Americana Crystal Gloss Enamels paint into the green Corpse Cola bottle, let run to the bottom of the bottle. Then cover the top of the bottle, turn upside down, and rotate to cause the paint to unevenly run down the inside of the bottle. Turn upright and let paint dry – some areas will have more paint than others – I liked the somewhat ghoulish effect of the blotchy paint inside the bottle. 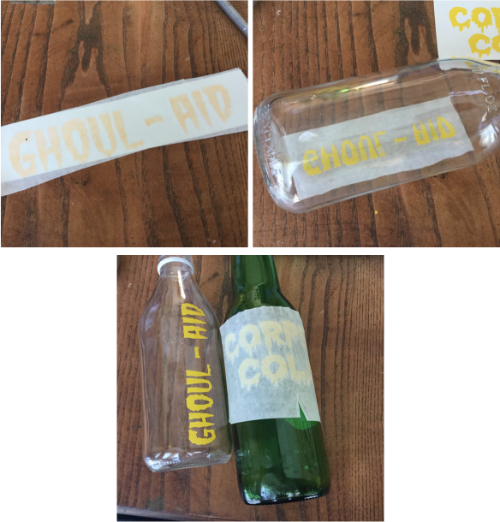 For the Ghoul Aid bottle, I added a small amount of purple cow DecoArt Americana Gloss Enamels paint to the bottle, and a few drops of water, then rotated the bottle to unevenly distribute the paint inside the bottle. Let dry. 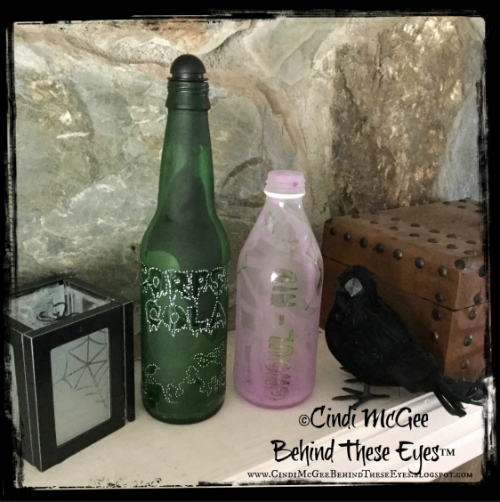 Use white DecoArt Glass Paint Marker to add dot outline around un-etched Corpse Cola and graveyard on green bottle, and green marker to outline the un-etched areas on the Ghoul Aid bottle. 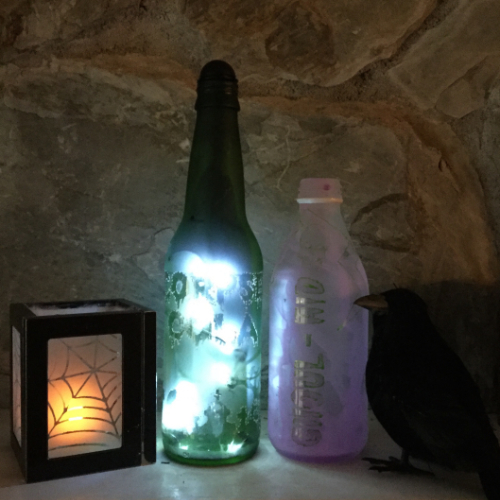 Insert “Light My Bottle” fairy lights into the Corpse Cola bottle to add a creepy glow!